This recipe originally appeared on Red, Round or Green. To make a more traditional palmier, you can use thawed frozen puff pastry instead of phyllo dough brushed with olive oil — the hearts will be flakier and more buttery with puff pastry, crisper and lighter with phyllo. Preheat oven to 400 degrees. Lightly grease a baking sheet or line with parchment. Combine the cheeses, sundried tomatoes, basil, salt, and garlic powder in a small bowl, tossing to mix thoroughly. Lay one section of the phyllo dough out onto a flat surface and brush all over with olive oil. Stack another section of dough on top, brush with olive oil, and continue with the remaining dough until you have six layers. Finish with phyllo dough — don’t oil the top piece. 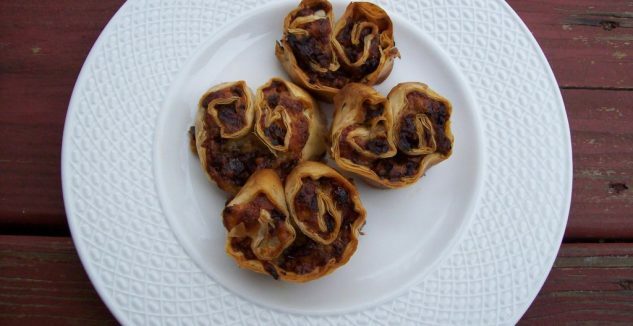 Sprinkle the tomato and cheese mixture evenly over the prepared phyllo dough. Beginning at one of the short ends, roll the pastry around the filling into a tight spiral, stopping when you reach the middle. Now repeat rolling from the other end, until the two spirals meet in the middle. Using a very sharp knife, trim the ends of the roll to neaten them, then cut the roll crosswise into eight heart-shaped pieces about 1/2 inch thick each. Lay the hearts on the prepared baking sheet and gently reshape them as needed.